Atopic dermatitis (AD) is a form of eczema that causes dry, scaly rashes that are itchy. Acute areas of AD can cause changes in skin color, creating redness or darkened areas. Chronic areas of AD can also create changes in skin color, as the skin becomes thickened, or lichenified. From TCM’s point of view, both eczema & AD could be related to the deficiency in one’s spleen and stomach system. Therefore, we could catch 2 birds with 1 stone via treating the skin conditions both internally and externally. For the internal approach, we could start with a fundamental spleen-tonifying formula, combining with Bema’s special formulated Eczema Support, which is not only effective in clearing the wind & heat, but also quickly resolving dampness & relieving the itch. 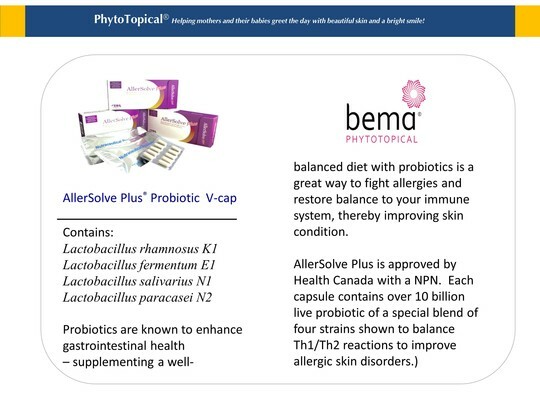 Moreover, during the acute stage, it is highly recommended to include AllerSolve, a special selection of four *medical grade probiotics, which could regulate the Th1 / Th2 reaction, as it breaks down, eliminates and inhibits the formation of harmful substances in the gut. Clinical evidence shows that AllerSolve could properly regulate the immune system and improve intestinal health, reducing body’s IgG and IgA levels. If taken during the remission stage, it could further show improvements to diarrhea problems and lactose intolerance, reduction in serum cholesterol levels and Helicobacter Pylori infections...etc. For the external approach, besides using acupuncture to tackle the meridians, it is also highly recommended to use Bema’s PhytoTopicals, a specially formulated topical solution for the dermatological treatment. 150H & 168R are the recommended protocols for both eczema and AD. This combination contains tincture and ointment, which are 100% botanical & steroid free. First, the 150H tincture should be applied in a thin layer, which can quickly penetrate the skin layer, acting as an efficient anti-inflammatory, antibiotic, & antipruritic agent. Next, we could apply a thin layer of the 168R ointment, which is not only effective in clearing the heat & dampness, invigorating the blood, but also creating a protective layer to seal the moisture, further alleviating the itchiness. If facial region is affected, it is recommended to combine the 161K hydrogel as well, which is the most gentle with minimal irritation, suitable for the sensitive skin type. 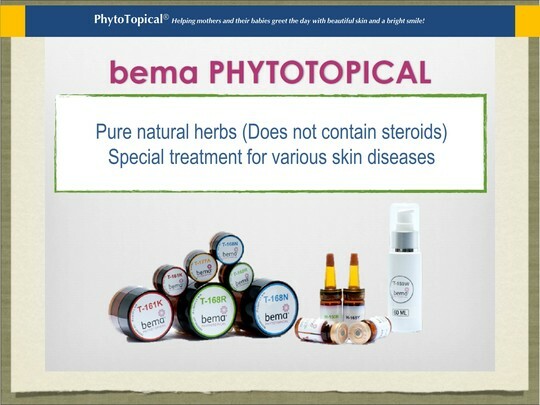 Bema Phytotopicals are made by pure TCM, which are all-natural botanicals that effectively tackle eczema problems with no side effects. When adhering to treatment protocols, and combined with internal TCM formulations & AllerSolve for internal use, patients’ symptoms generally stabilize after about 2 weeks’ time. Many experience full recovery in approximately 3 months.